A new mechanism driving spread of cancer has been identified. A protein commonly found in human cells could be an important switch that activates cancer cell metastasis, according to a new study by researchers at the Montreal Neurological Institute and Hospital, McGill University and the MUHC. The finding focuses attention on a biological mechanism that until now was largely overlooked. The discovery of the protein’s effect significantly expands the medical community’s understanding of epithelial cancers such as breast and lung cancer. The current study examined the function of a protein called DENND2B. During childhood development, DENND2B likely plays a role in the normal migration of cells. In adults, cell migration is greatly reduced, but in the case of cancer, there is unwanted cell migration, contributing to one of the most puzzling aspects of cancer cells, metastasis to new locations. The study is published in the Journal of Cell Biology. The team explain that DENND2B activates another protein in the cell called Rab13, which is an enzyme that promotes cell migration. Until now, researchers were unaware of how Rab13 was activated to initiate cell migration. The researchers found that Rab13 has an unusually high degree of expression in many forms of cancer, especially epithelial cancers that often metastasize to the brain. It was therefore important to see exactly where in the cell Rab13 was being turned on. Where it’s activated is important for figuring out how it functions. The team saw that the DENND2B protein was activating Rab13 at the leading edge of the cell, an important point for cell migration. The group sees Rab13 as a focus for future research into cancer therapies. The laboratory showed a significant result in human breast cancer cell mouse models under two conditions, one with cells having high levels of Rab13 protein, and one in which Rab13 was artificially removed. In the case of the cells with reduced Rab13 levels, the cancer either did not grow at all or formed a smaller tumour. Furthermore, the smaller tumour did not metastasize into other tissue. The team summise that although preliminary trials are extremely promising clinical trials involving the discovery are still some time away. Optimization and validation of a Rab13 biosensor. 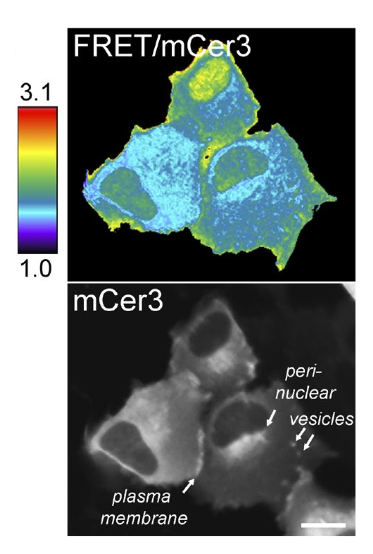 Ratiometric image (FRET/mCer3) and mCer3 image of MCF10A cells expressing the wild-type Rab13 biosensor showing proper localization. Bar, 10 μm. (J) Comparison of Rab13 biosensor ratio intensity to computational ratio intensity predicted solely on cell volume as determined by GFP staining (mean ± SD measuring six cells pooled from two independent experiments). DENND2B activates Rab13 at the leading edge of migrating cells and promotes metastatic behavior. McPherson et al 2015.